When I first attempted to digitize this tape it was unplayable due to the felt contact tab in the tape having fallen out. Thanks to Scott Colburn ("The Viscera Dude") for repairing this tape. 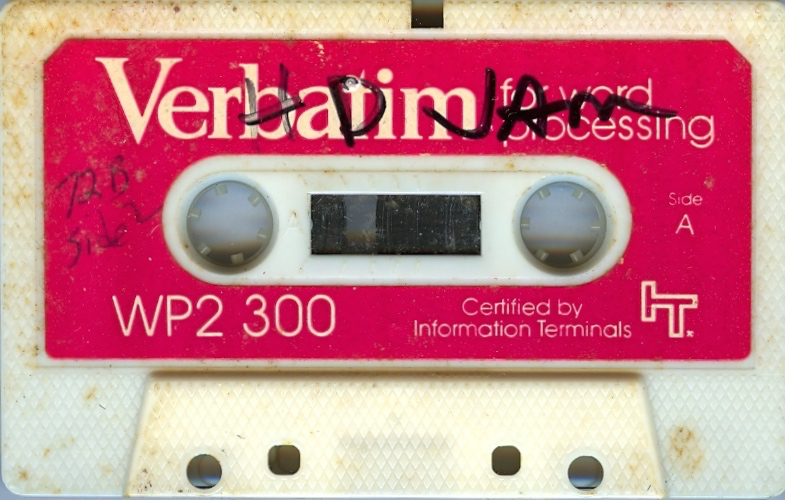 This is a Verbatim brand WP2 300 cassette for Word Processing. There are numerous markings on the cassette from its previous use as a computer data disc. 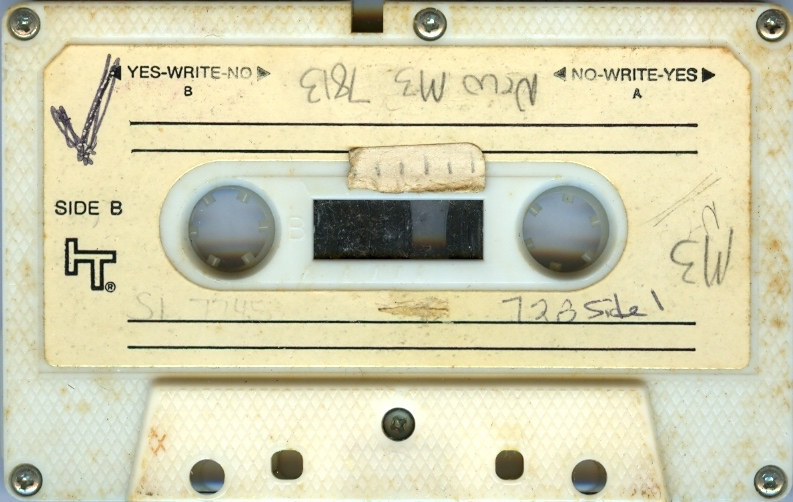 Debbie wrote "HD JAM" on the first side of the tape in black magic marker. All of the sounds on this cassette were recorded with Debbie's Panasonic RQ-309AS mono shoebox-style cassette recorder. Dates of recordings not noted but these sounds were probably recorded in Summer 1982. - 00:19 Hal and Debbie are heard doing a vocal duo improvisation experimentation of non-verbal voice sounds, mostly vowel-like sounds. - 02:05 - Casio VL-1 (VL-Tone) and a second Casio VL-1. Debbie probably played the repeating bass part and Hal the other, higher-pitched Casio part. The drum machine on one of the VL-1's is being used. The Casios were probably played through my Marlboro brand guitar amplifier, which had two inputs. I am not sure about this, though, because the Casios could have been played through their own built-in speakers (because I don't hear the usual reverb and tremolo effects that we always used on the amp). - 06:10 - 10:26 - Another jam, again two Casio VL-1's. The drum machine of one of the VL-1's is being used. - 10:27 - unidentified music that had been previously recorded on the tape is briefly heard for two seconds. - 10:29 - 18:56 - Another Casio VL-Tone duo jam, very fast staccato sounds, then at about 16:00 we slow the tempo way down. - 18:57 - Music previously recorded on the tape. This is from Santana's Moonflower album [not included in the audio player]. more from Santana's Moonflower album [not included in the audio player].